George W. Bush still has more than two years to serve as president, but it isn’t too early to proclaim his foreign policy to be a failure. America no longer is seen as unbeatable; its moral authority has largely dissipated. What has been termed resolute will at home is seen as foolhardy arrogance abroad. U.S. friends have grown distant, while China and Russia are resisting American initiatives. The finest military on earth is being wrecked in pursuit of secondary goals. The war in Iraq has lost the international goodwill generated by 9/11 and emboldened terrorists the world over. Iran and North Korea are moving ever closer to becoming nuclear weapons states. Washington’s supposed democratic crusade is widely seen as both inept and hypocritical. After the war in Lebanon, Israel is even more distant from peace, further sullying America’s reputation in the Muslim world. Yet alternative foreign policy visions seem in short supply. The traditional conservative movement is dead. The short list of Republican presidential candidates is dominated by unthinking hawks who mimic George W. Bush’s recklessness. By and large conservative pundits want to bomb more countries and kill more people. The American Enterprise Institute and Heritage Foundation have adopted liberal Wilsonianism to guide their policy advice. The Left is little better. While the fecklessness of the Bush administration continues to amaze, the Republicans are different in degree rather than kind from the Clinton administration. After all, it was a Democratic president who took America into a Balkan war in which the U.S. had no stake and which ended up validating ethnic cleansing by America’s allies  all in the name of humanitarianism. Today, the Left objects more to the Bush administration’s dishonesty and incompetence than to its objectives. Most leading Democrats backed the Iraq war; most liberal analysts implicitly support the neoconservative agenda, having advocated the bombing of Kosovo and invasion of Iraq, and proposing to occupy Darfur. Yet it is promiscuous intervention that is bringing America to ruin. In short, at the moment when U.S. foreign policy is in crisis, indeed, in greater disarray than any time since the Vietnam War and perhaps World War II, there is no effective political opposition or philosophical alternative. In terms of foreign policy, Washington is bankrupt. Ethical Realism offers a glimmer of hope. Concise and informative, the book carves an alternative path out of Washington’s foreign policy wilderness. The authors are Anatol Lieven of the New America Foundation and John Hulsman, formerly of the Heritage Foundation. Both writers have lost jobs because of their policy independence. Most recently, Hulsman, who initially supported the Iraq war, was fired by Heritage  which has abandoned Thomas Jefferson for Woodrow Wilson  for writing this book. An organization that was skeptical of President Bill Clinton’s misguided joy ride in the Balkans now cheerfully promotes nation-building on the Euphrates. The animating force behind Ethical Realism is what the authors see as the veritable collapse of American foreign policy. In its drive to assert U.S. primacy, the Bush administration actually has weakened America and reduced its global influence. Judging consequences alone would lead one to question the patriotism of President Bush and his neoconservative allies. But the blame is bipartisan. Most Democratic paladins routinely regurgitate the administration’s goals, simply promising to run the world competently, and with UN approval. Even many on the Left would have supported the Iraq war had it been advanced by one of their own. This philosophy has failed, and failed disastrously. Of course, this isn’t the first time that American foreign policy was tested and found wanting. Vietnam, too, taught America a painful lesson about the limits of military power. But the stakes today are higher, argue Lieven and Hulsman: “Despite the illusions of that time, Indochina was never really very important to the United States, to its leadership in the world, or to the world economy.” The Middle East is very different. Moreover, the ability of Vietnam or Iraq to hurt the U.S. was very limited. Not so al-Qaeda and allied groups. And in the authors’ view, developing a serious response to the terrorist threat requires a new balance of realism and morality. The point is not that neoconservatives and liberal hawks don’t appeal to both sentiments. But, write Lieven and Hulsman, “Their answers, however, go much too far in the contradictory directions of both hard-line realism and utopian morality  or rather, as we shall argue, pseudo-realism and pseudo-morality.” As a result, the promiscuous interventionists have failed, and failed dramatically. Although American elections usually turn on domestic policy, there have been times when much depended on the choice in foreign policy directions. Lieven and Hulsman point to “the Truman-Eisenhower moment.” Although the two men were, shall we say, not close, their policies were largely consistent. In brief, centrist Democrats like Harry Truman had to fend off naive accommodationists like former Vice President Henry Wallace. Centrist Republicans like Dwight Eisenhower had to restrain hard-liners advocating preventive war and the “rollback” of communism. Moreover, note Lieven and Hulsman: “The former supreme commander of the Allied forces in Europe during World War II also knew  as few civilian politicians could and as the neoconservatives and the Bush administration certainly do not  the human costs of war.” There were pessimists at the time, conservative pundits like James Burnham of National Review, who thought that without preventive war the free world would likely lose. But the caution of containment laid the basis of ultimate victory. The foreign policy constellation today tracks that of the Truman-Eisenhower era. There’s a small, woozy Left, which seems prepared to make common cause with jihadists whose fondest dream is beheading godless hedonists. More ominous is the coalition of liberal hawks and aggressive neoconservatives  which now directs U.S. foreign policy. Lieven and Hulsman manage a difficult feat  they provide a sophisticated foreign policy analysis in easily understandable prose. Given the catastrophe that American foreign policy has become, Ethical Realism is obviously a book for the community of policymakers and analysts who dominate the making of U.S. foreign policy. But given the fact that many of these people are responsible for creating the current mess, interested citizens also should read the book. For only with increased popular involvement, and particularly the willingness of informed voters to make foreign policy an election concern, is policy likely to change. There are several essential preconditions to a philosophy of ethical realism, preconditions completely lacking in the philosophy of neoconservative imperialism, which dominates administration policy. One is prudence. “For obvious reasons, prudence applies especially to the launching of military operations,” they write, prudence that was sadly lacking at almost every stage of the Iraq disaster. Another requirement is “national humility, and the tolerance and patience that stem from it.” That, of course, is entirely absent from those who believe in global social engineering, that Washington has been anointed to transform the entire world. It’s worth reflecting on Lieven’s and Hulsman’s argument. America, no less than its citizens, should exhibit prudence and humility, study the world, accept responsibility for its actions, and exhibit real patriotism. This is a powerful argument, and in today’s political climate  where dissent is tagged as defeatism and treason  a courageous one. America is not entitled to rule the world just because we believe we are wonderful, sweet, public-spirited, selfless, and all-around good guys. It should not surprise us that other nations aren’t going to let us do so. So maybe we shouldn’t try to do so. Even Washington should live by standards that sometimes limit our conduct. They emphasize the importance of increased foreign aid, an Israeli-Palestinian settlement, a mix of engagement and multilateral pressure on Iran, and recognition of the valid interests of China and Russia. For Iraq, where the administration’s most far-reaching goals are hopeless fantasies, they suggest a regional concert dedicated to containing the incipient civil war. In the main, their solutions are measured and thoughtful, though occasionally in error. For instance, the record of foreign aid for development (in contrast to some forms of humanitarian assistance and military support in some circumstances) is woeful. Indeed, it is beyond bad. There is no reason to believe that massive new transfers as part of massive new programs will increase growth rates in poor states. The authors also want to maintain America’s implicit security guarantee for Taiwan. The latter is an attractive friend, but its de facto independence is not obviously worth a confrontation with nuclear-armed China. It’s one thing to provide Taipei with the means to defend itself. It’s quite another to defend the Taiwanese. Still, these are minor quibbles. 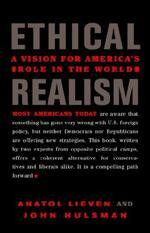 Ethical Realism is a refreshing read, an insightful analysis that simultaneously critiques the mess that passes for American foreign policy today and offers a solid alternative. The book deserves wide attention and careful study. As the authors argue, the stakes are high. Here, truly, failure is not an option; otherwise the fools who have mismanaged the affairs of the world’s greatest power will plunge America into additional conflicts at even higher costs than the Iraqi imbroglio. This is a message that must be widely heard and understood by Americans. And they must act on it. Otherwise, Washington seems bound not just to repeat, but to multiply, its recent grievous errors.